The query was prompted by a story published Monday by The Blaze and discussed by talk show host Glenn Beck. A Blaze staffer said an unnamed Obama administration told him Abdel-Rahman's release was being "actively considered." It was Abdel Rahman's imprisonment, and not alleged offense to an anti-Muslim video, that triggered violent protests outside the American embassy in Cairo last week, U.S. intelligence officials say. "The blind sheik is going to serve out his life sentence," National Security Council spokesman Tommy Vietor said on Wednesday. "There are no discussions about transferring him. These reports are wrong." "I think the plan has been to agree to the Blind Sheikh's release, but not to announce it or have it become public until after the election," McCarthy said. "That is consistent with Obama's pattern of trying to mollify Islamists. Obviously, they did not want this information to surface yet… but sometimes a situation can spin out of control." Since it has been confirmed that ex Gitmo residents are waging jihad again, the "progressive" Brown Shirts should keep their lying mouths shut. Not ONE US soldier, marine, sailor, or airman should ever loose his life to a terrorist we already caught, but was released by traitorous politicians. We sacrificed so much to get these guys just so Democrats could release them and then accuse US of some sort of wrong doing while their mujihadeen buddies get promotions and fight the West with renewed vitality. What isn't partisan about American patriots on one side, and the "American left," which is the true right wing, on the side of Muhammed and America's national enemies? Ian, shove your hypocrisy. 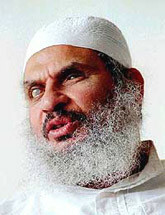 The State Department is not only planning to release the Blind Sheik, but half of current Gitmo detainees if Obama is reelected. YOU obviously don't take terrorism seriously, and YOU are "dissapointing." This is the same State Department that is directly funding Al Quaida and the Muslim Brotherhood. They aren't to be trusted, and Hilary's use of the word "should" should say more than a thousand Obama words. This article is as non partisan as it gets, and it beats the heck out of the Huffpo garbage you probably live on. CNN knew on the day of the protest; this article was written on Sept 14th and link off badblue. "Just before the crowd in Cairo, Egypt erupted in violence against the U.S. embassy there, CNN's cameras were in the capital interviewing protesters who said that the main purpose for their protest was to have Sheik Omar Abdel-Rahman (known as the 'Blind Sheik') released from a U.S. prison. Yet as soon as the riots began, CNN began to push the false story that the riots were sparked by some low-budget American movie that denigrated the Prophet Muhammad. The very day before rioters stormed the U.S. embassy in Cairo, CNN's Nic Robertson filmed an interview with a handful of Islamists right outside the U.S. embassy. One of those protesters that CNN interviewed was the Blind Sheik's brother, Mohamed al Zawahiri". "Spokesmen for the Justice Department and National Security Council say that is what is going to happen." "'The blind sheik is going to serve out his life sentence,' National Security Council spokesman Tommy Vietor said on Wednesday. 'There are no discussions about transferring him. These reports are wrong.'" Terrorism is an important issue, one that should be above this kind of petty partisanship. I fully expect Republicans (and Democrats) to use this for political gain, but for a reputable organization such as yourselves to do it is dissapointing.